Reasons for concern: This is a pioneer plant in forest environments that have been burned or seriously disturbed. They can help hold soil in place until native plants and grasses return, but they are not eaten by wildlife. Especially in home landscapes, their large rosettes and leaves can prevent the growth of desirable native plants and grasses reducing native plant diversity. Botanical description: Tall, erect, fuzzy herbaceous plant. Leaves: Large, thick rosette of fuzzy leaves in the first year. Alternate, sometimes overlapping along the flowering stalks. Much larger toward the base of the plant. Bluish gray-green and felt-like, ranging from 4 to 12 inches in length and 1 to 5 inches in width. 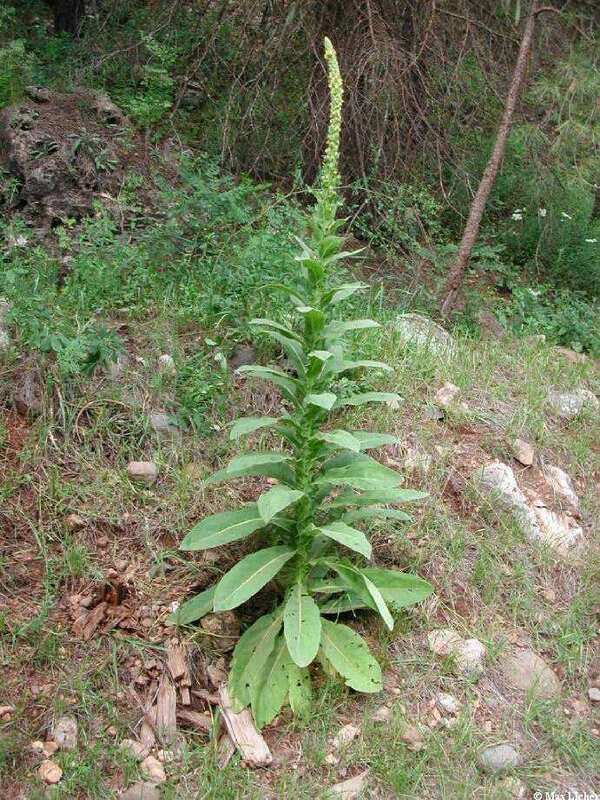 Stem(s): Single, tall, erect, flowering stalks grow 5 to 10 feet high, including flowering stalk. Dried stem usually persists in winter. Flowers: Yellow flowers with 5 yellow petals, borne on a large spike. Flowers bloom a few at a time from April through September. Seeds: Produces a huge number of tiny seeds, which are pitted and rough with wavy ridges and deep grooves. Where it grows: Prefers dry, sandy or gravelly soils. Widespread in meadows, desert scrublands, woodlands and pine forests, where there are sunlit openings from 3,000 to 9,500 feet. Intolerant of shade. Life cycle: Biennial. Basal rosette forms the first year. Bolts, flowers and dies in the second year. Weedy characteristics: The average plant can produce 100,000 to 200,000 seeds, which can remain viable after lying dormant in the soil for several decades, even up to 100 years. 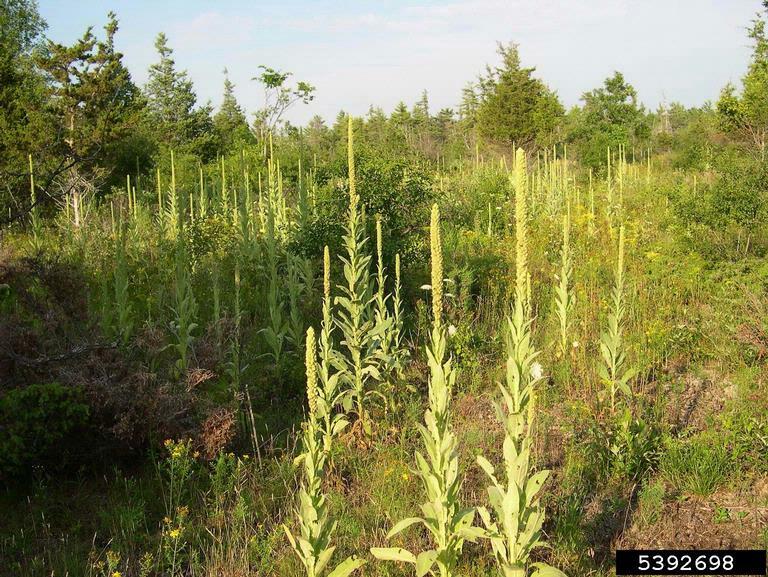 Large numbers of seedlings can appear after a disturbance, such as logging, tilling or forest fire. Requires little moisture to germinate. Can overtake a site in a short period of time. Control strategies: Shallow roots make them easy to hand pull. Pull or dig them out as small rosettes. Step down any loose soil after the plant is removed. Early in the season, if a plant has produced a stem, dig or pull out the plant. If it is late in the season and the plant has flowered or even produced seeds, you can dig out the entire plant, or you may want to cut off the flower head or seed head to save time. Be sure to hold the flower head upright, so the seeds don’t drop out. Bag the flower or seed head. You may want to leave the rest of the plant until the following spring, or cut it off and leave it on the ground. Reduce available bare ground by sowing native grasses and plants. Frequently monitor previous infestations for new growth.